SYNOPSIS: In Paramount Pictures and Nickelodeon Movies’ family comedy “Imagine That,” Eddie Murphy stars as a successful financial executive who has more time for his blackberry than his seven-year-old daughter (Yara Shahidi). When he has a crisis of confidence and his career starts going down the drain, however, he finds the solution to all his problems in his daughter’s imaginary world. REVIEW: Previously known for the screenplays of "Chicken Run", "The Spiderwick Chronicles" and for the direction of the animated film "Over the Hedge" Karey Kirkpatrick makes his second directorial outing with "Imagine That". A film that is not as bad as it look in its trailer, but is not more than average. After watching the trailer of this movie, I have to admit that I wasn't expecting much out of it. And during the actual film showing, I was getting ready to either take nap or to leave the theater in the middle of the presentation. 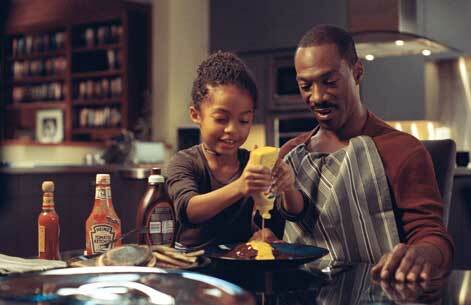 Yet, Eddie Murphy and Yara Shahidi save the film with a couple of comic scenes and some daughter father endearing moments. The film is in the tradition of "Daddy Day Care" and "The Game Plan"; child vs. adult that after a few misadventures end up in a happy ending. After the separation of her parents, young Olivia ends up contemplating a magical world under her blue blanket or Goo-Gaa which turns out to have spiritual powers that can predict financial outcomes in the stock market. When her greedy father finds out this, he becomes entrapped in his daughter's magical world realizing there is nothing more magical than the time they spend together and being a parent. While the message of family values is clean and clear for all audiences, the financial misadventures of Eddie Murphy can be quite confusing for the young audiences. Furthermore, the film is very predictable and lacks cinematography creativity, which is eye catching a enjoyable for children. Needless to say, the title of the film is misleading and would have kids saying "what was that?"